What’s New in Attached at the Heart? The second edition of Attached at the Heart is now available! Our intention in writing our book in the first place was to supply you with important information to help you make informed decisions. New information just keeps on coming! We can no longer accept advice at face-value, especially when it comes to our children. We have to question everything and do the necessary research on our own. We have tried to help you do just that in our updated edition of Attached at the Heart with incredible new research and information, some of which has been hidden from the public. Some of the information may be shocking and unsettling but liberating as well. For some it may stir up feelings of fear and guilt but our intention is to empower you, knowing that we can’t be held responsible for what we didn’t know. New research comes out weekly and Attachment Parenting International has a great Enewsletter called API Links that compiles the latest information in a variety of areas of study. 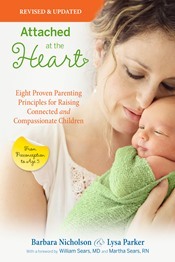 Go to attachmentparenting.org and sign up! We’d love to hear from you and your comments about the book. New cover is beautiful! I own the first edition, so I will definitely get the updated copy too. The thing I have found the most helpful are the copious suggestions for further reading at the end of each chapter. Is an audiobook version of this book available or forthcoming?